_Perennial or biennial herb, Creeps by producing roots along trailing stems (stoloniferous). 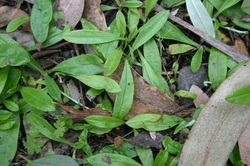 Lance-shaped leaves, broader towards the tip form in a basal pattern with distinct mid vein. Length ranges from 40 - 200 mm and width from 4-10mm. Light green with sparse hairs on top. Light coloured to white below and hairy. Naturally From seed, stem layering.plants in moist well drained soils in sheltered sites. Semi-shade to full shade.